Acclaimed Pacific Northwest chef David Machado presents two unique dining options at Hotel Eastlund. Altabira City Tavern and Citizen Baker are culinary destinations that reflect the true personality of one of Portland’s fastest growing neighborhoods. 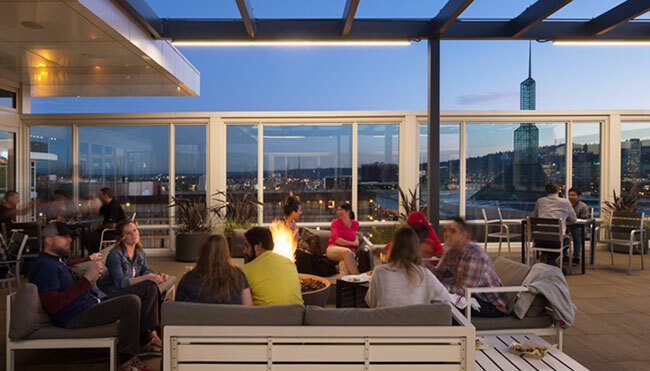 Perched high above Portland’s burgeoning Eastside with sweeping views of the downtown Portland skyline, Altabira City Tavern is the hotel’s rooftop bar and restaurant, showcasing a few of chef David Machado’s favorite things. Modern updates on classic dishes. Smart pairings of food and drink. Creative settings that excite and inspire. Altabira expands your horizons with 16 taps of local craft beers, select Northwest wines, locally distilled spirits and carefully balanced dishes. The dining room seats 60, the bar seats 34, and the gorgeous rooftop patio—with windbreaks, heaters and fire pits—accommodates 103. Five stunning private dining rooms feature floor to ceiling windows and amazing views. At Altabira City Tavern, you will experience Portland in ways you’ve only imagined. A labor of love, flour and water, Citizen Baker is a locally owned urban bakery and café on the lobby-level of Hotel Eastlund. Think loaves of artisan breads, select pastries. Ristretto Roasters single origin coffees. Hot breakfasts, fresh salads, inventive sandwiches and soups. Join us for breakfast or lunch. Or, come to our wine bar for a late-afternoon local craft beer or delicious wine by the glass. We’re in a light-filled, elegant space in a great neighborhood on the move. Chef David Machado’s passion for food, life, community—all in a modern cafe. Altabira City Tavern and Citizen Baker were both designed by the young creatives at Holst Architecture. The restaurants echo the clean, contemporary decor of Hotel Eastlund and feature indoor and outdoor seating, weather permitting. Learn more at www.altabira.com and www.citizenbaker.com.